A new style of multi-touch keyboard has been developed in the form of the new TouchKeys Multi-Touch Musical Keyboard which has been created by Andrew McPherson in the UK. TouchKeys Multi-Touch Musical Keyboard has been designed to control any instrument or synth that speaks MIDI or OSC including VST and AudioUnit plugins and programs like Max/MSP, Pd, SuperCollider, Kontakt and Reason. Watch the video after the jump to learn more about the TouchKeys Multi-Touch Musical Keyboard project and see it in action. “Every keyboard player knows the problem: playing and releasing notes is easy, but shaping what happens in the middle is hard. 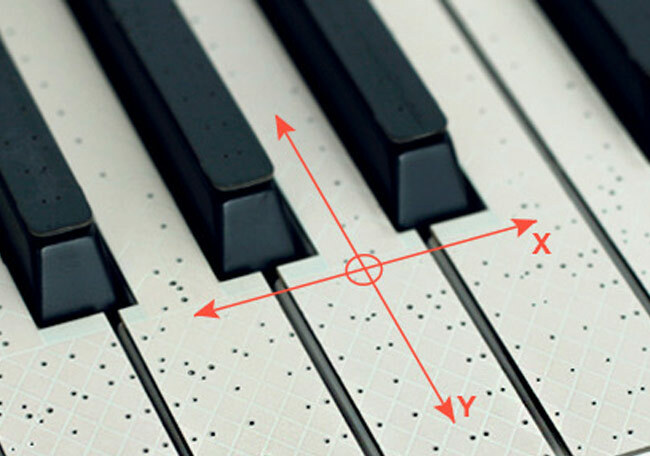 The acoustic piano wasn’t designed to play vibrato, pitch bends or timbre changes, and if you want these techniques on an electronic keyboard, you’re usually stuck with clumsy wheels and pedals or limited aftertouch. The TouchKeys instead put these techniques literally at your fingertips, giving you continuous expressive control with a shake of the wrist or a slide of the finger. The TouchKeys Multi-Touch Musical Keyboard project is currently over on the Kickstarter website looking to raise enough pledges to make the jump from concept to production. So if you think TouchKeys Multi-Touch Musical Keyboard is something you could benefit from, visit the Kickstarter website now to make a pledge and help TouchKeys Multi-Touch Musical Keyboard become a reality.